Remaining in London we seek out another popular brand that has captivated the public with its innovative products for decades. Only a couple of minutes walk west from Argyll Street and you arrive on one of the most famous shopping streets in the world. Regent Street is where this leading technology giant opened its first European retail store in 2004. It’s incredible to think how prevalent this brand has become particularly since the launch of the iPhone in 2007. They now have nearly 500 stores in 20 countries. The Apple brand has become a part of our lives and popular culture. Sleek and sophisticated, consumers just adore them. 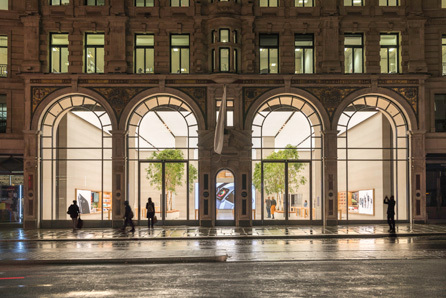 Therefore, it is only fitting that the London flagship should be nothing less than awe inspiring and it is exactly that - a stunning environment in every sense of the word. The store’s height is formidable – the full 7.2 metre double height space that you enter into from the busy street outside has been utilised in its entirety. The Grade II listed, historic facade has also been fully restored and preserved and allows daylight to flood in through its great, ornate arches. The ceiling has been clad in lighting panels to form the longest, luminous ceiling panel in the world. Not only does it emit a pure, even white light that lights up the entire, gargantuan interior, but it also has the capability to absorb ambient noise below. Cutting edge technology is never far away. The surrounding walls - from floor to ceiling on all sides – are clad in sandblasted stone, as are the two staircases on either side of the store at the rear. The balustrades are simply sublime. Seemingly carved into the stone wall behind, they have a smooth, curved and honed finish that is very tactile indeed. Both the walls and balustrade were created by a combination of handcraftsmanship and CNC robotics! Once again, state of the art technology is at the root. However, the pièce de résistance are the trees. Twelve fully grown Ficus Alis in giant planters are placed at the very heart of the store creating a haven of peace and tranquillity and there is circular seating for customers to relax and unwind. Lined up on either side, in an orderly fashion and together with the surrounding, natural environs, they achieve the effect of an Italian piazza or Spanish plaza. How clever of Apple to bring the lure of the open air instore, where better to get to know the world’s favourite brand? On first glance it’s easy to miss the product – this is an experience based environment and everywhere you look people are heads down focused on a screen of some sort, or in deep conversation with a sales assistant. Yet, as with the overall store design the product is clearly and neatly presented. 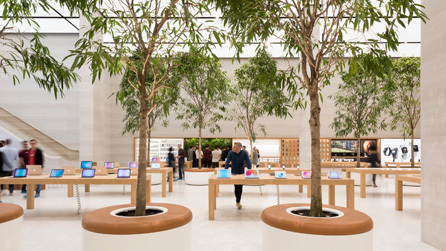 In the centre of the square many large, wooden, bespoke display tables showcase a wide range of Apple products, whilst on the outer side of the avenue a plethora of Apple accessories and product line the signature wall display units and are waiting to be tried out. At the rear of the store is the Forum, an area where experts from various fields can come to entertain, inspire and teach. It has been given a prime location in the centre of the square and behind it is the most formidable feature; a vast video wall of crystal clarity that somehow manages to compliment the environment rather than distract. 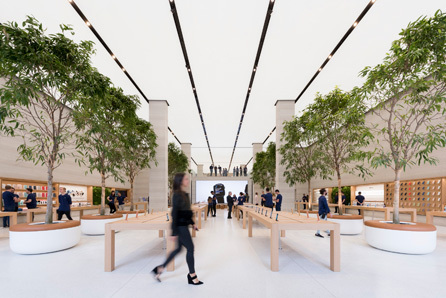 It provides an animated backdrop for the entire store and is a reminder of just how ingenious Apple is. Finally, overlooking this, the mezzanine hosts the Geniuses, an area where visitors can get help and assistance with their devices and the Boardroom, a place for meetings, conversations and partnerships. It is an impressive view from the mezzanine looking through the store to Regent Street beyond. An incredibly thick glass balustrade separates you from the sales floor many metres below. You can’t fail to be impressed by the sheer beauty of this interior. Its simplicity and subtlety exude quality and craftsmanship that convey the very essence of the brand. It is a very hard act to follow.